Minor flooding for some of San Diego County's coastal areas is possible through Monday as high surf rolls through the weekend. 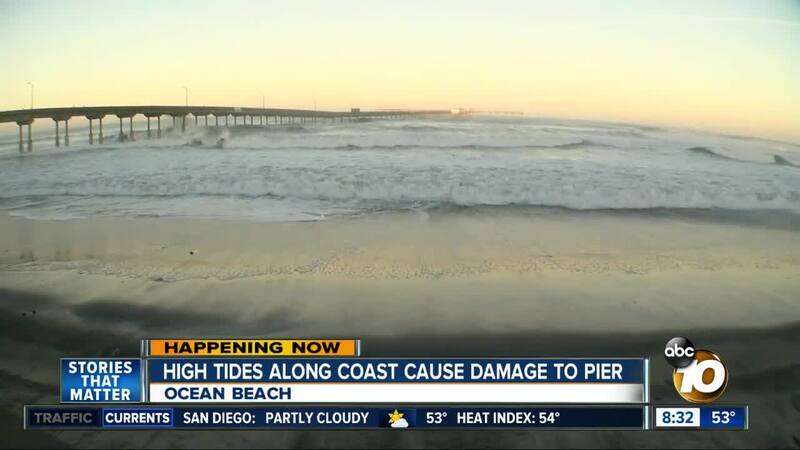 SAN DIEGO (KGTV) — Minor flooding for some of San Diego County's coastal areas is possible through Monday as high surf rolls through the weekend. West to northwest swells will bring four- to seven-foot surf to San Diego County's coastline through Monday, according to the National Weather Service. The surf, combined with morning high tides near seven feet, could result in minor beach flooding in flood-prone areas, including Seal Beach, Sunset Beach, Cardiff, La Jolla, Mission Beach, and Imperial Beach. High tides are expected to reach anywhere from six and a half to nearly seven feet between Saturday and Monday in La Jolla. A beach hazard statement is in effect through Monday morning. A high surf advisory has been canceled, though a water advisory is still in effect due to the elevated surf and possible rip currents. Friday, high surf battered Ocean Beach Pier, damaging about 200 feet of rails and portions of the pier. Coastal flooding in the North County and South Bay were also seen. Several homes experienced debris washing up to properties and streets in Imperial Beach and parking lots along the coast in Cardiff were littered with dirt and rocks from elevated surf.